Wheel damages train track, causes changes in trains and schedules. 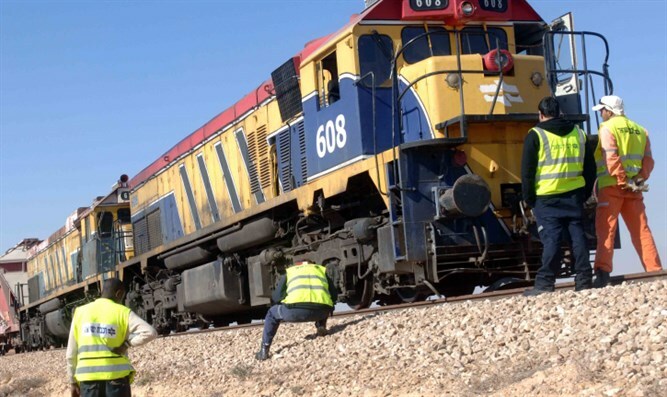 Israel Railways announced on Monday morning changes in the train schedule, after a cargo train damaged a piece of track at 2am Monday morning. "Last night, at 2am, one wheel of a cargo train's engine slipped off the track near the Shefayim station. Both the point and the track suffered damage which must be immediately repaired. Thanks to the staff's awareness, much greater damage has been prevented," said an Israel Railways spokesperson. As a result of the repairs, trains will run on one track instead of two, causing delays and changes in route. Trains from Nahariya to Be'er Sheva will end at Haifa Hof HaCarmel Railway Station, while trains from Be'er Sheva to Nahariya will end at Tel Aviv HaHagana Railway Station. The train from Jerusalem to Rishon Lezion will end at Tel Aviv HaHagana. Though Israel Railways has promised it will work as fast as possible, there is no information on when the trains are expected to resume normal activity. At these stations, there will be alternate trains which passengers can take to their intended destinations. Trains are expected to be more crowded than usual, and the Israel Railways suggests passengers when possible use other means of public transportation once they arrive at Hof HaCarmel and Tel Aviv HaHagana. In addition, there were several electric issues at Tel Aviv HaShalom Railway Station on Monday morning. However, these do not affect the trains' schedule.